The Somali peninsula has a rich heritage relevant to the world. Many ancient world civilizations have left their mark on this area, a connection facilitated by the region’s strategic location, connecting Arabia, Africa, and Asia through the Red Sea Coast, the Indian Ocean and hinterland routes to North Africa, and the Swahili Coast. Ancient long-distance trade is confirmed by archaeological finds from Ras Hafun that demonstrate a Greco-Roman trade affiliation (Chittick 1975; Smith & Wright 1988). Furthermore, historical sources in Greek, The Periplus of the Erythraean Sea (translation Schoff 1995), and Chinese (Freeman-Grenville 1962) also verify long-distance trade, and Somali’s own seafaring traditions in different prehistoric periods (Hourani 1995) attest to contacts with India, China, North Africa, Arabia, Persia, and Eastern Africa, with which Somalis share Swahili culture (Chittick 1969). Arabic (Gibb 1962) and Portuguese sources provide accounts of medieval coastal towns such as Muqdisho, Merka, Baraawe, Berbera, and Saylac. The commercial and cultural contact network in the hinterland is reflected both in archaeological remains (Smith & Wright 1988) and other sources such as oral tradition and historical records. Recent unpublished archaeological discoveries show links with ancient Egypt, Roman, and Greek world, South Arabia, India, and Ming and Yuan dynasty China. It is therefore clear that the region is a cultural crossroads. 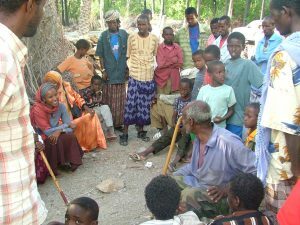 Related article Mire S. (2011), The Knowledge-Centred Approach to the Somali Cultural Emergency and heritage development assistance in Somaliland., African Archaeological Review 28(1): 71-91.